Also about the Rev John Presland of the fourth generation. On 18th June I commenced work, - in a desultory sort of fashion, - on this chapter. Like the first chapter, it will be knocked off at some speed (too many important things of today and the future are about for me to spend too much time on the past) but with some fascination in it all. As the first chapter was just in time for John's birthday, so this second chapter will be in time for Elisabeth's birthday. Chapter 3, be sure, will be on your tables by Judith's birthday. John and Mary Ann, so W.A.Presland told us, had five sons and three daughters. Of these, one son and one daughter remained firmly attached to the faith of their parents (and grandparents, for John was already the second generation.) Others must, if they want, try to trace the other lines, but I have never done so. In this chapter, I shall concentrate almost entirely on the two who are so well documented in New Church literature. The truth is I suppose that I am not a research student in this matter but simply a collector of snippets to which over the years I have had better access than most of us. Certainly too at home the Presland children would be moving in nice surroundings and with people of some standing. I have already referred to Flaxman - a friend evidently of John Presland and probably a fairly regular visitor at 224 Piccadilly and at the King Street house, from his own home in Jermyn Street. Flaxman of course was a distinguished member of the Royal Academy and Professor of Sculpture there, (in my books, there is a copy of H. M. Morris "Flaxman, Blake Coldridge and other men of genius influenced by Swedenborg," published by N.C Press in 1915'" Morris was a fine man, but as a historian he needs to be watched a little.) But I give you a cutting from a "History of the Swedenborg Society 1810 to 1900" by Dr. Freda Griffith (who got an MBE for services to The Swedenborg Society) which may interest you and fill in, more clearly, some facts. Cutting from a "History of the Swedenborg Society 1810 to 1900"
It may be mentioned here that there have not been many years in the Society’s history when a Presland has not been active in it. This first John Presland was on the Committee from 1810 to 1827, was Chairman in 1812 and Secretary for one year in 1815. The Rev. 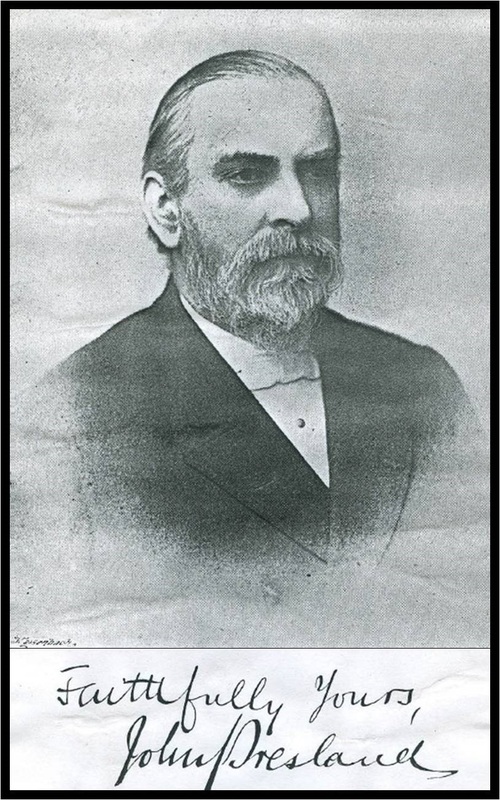 John Presland was a member from 1870, was on the Committee from 1872 to 1896 and was Chairman in 1878, 1884 and 1889. The Rev. W. A. Presland was on the Committee from 1899 to 1936, and was Chairman in 1909 and 1923; he was on the Advisory and Revision Board for the same period and held the office of Chairman on five occasions and of Secretary for ten years. The Rev. J. R. Presland was Secretary of the Society from 1923 to 1931, and continued as Honorary Librarian until 1939. The Rev. C. H. Presland, who joined the Society in 1945, became a member of the Council in 1956. To show that we thy precepts love. With infinite and pure delight. Oh may we never go astray. Perhaps not very good poetry, not Poet Laureate stuff! But I imagine Joseph Proud knocked it off before dinner, to keep little William amused and alert? Willie was born in 1806, so I imagine we are about at 1816, with the family still at Piccadilly and Willie one imagines a rather sickly child. But who were his brothers and sisters with whom Joseph Proud thought his hymn might be sung? All these baptismal dates (with dates of birth) are extracted from registers in the Public Record Office, Chancery Lane. (Document 4501, Lambeth, Waterloo Road..) Interestingly, the same document has an entry 359 "Mary Ann Presland, Adult. Baptised by me Samuel Neale April 14 1823." It also has references to seven baptisms of the children of Samuel and Harriet Presland, born between 1813 and 1820, who were all cousins to John and Mary's children named above. Of these children baptised, I know little save, of course, for Thomas and Mary Ann, both of whom as W A Presland (my Grandfather) remarked, stayed firmly within the Church and therefore turn up in the periodicals of the time. Present Schools, erected 1874, enlarged 1901. The Church has been beautifully decorated by Messrs. Kendal, Milne, & Co., of Manchester, 1908. Interior of Church — North end. 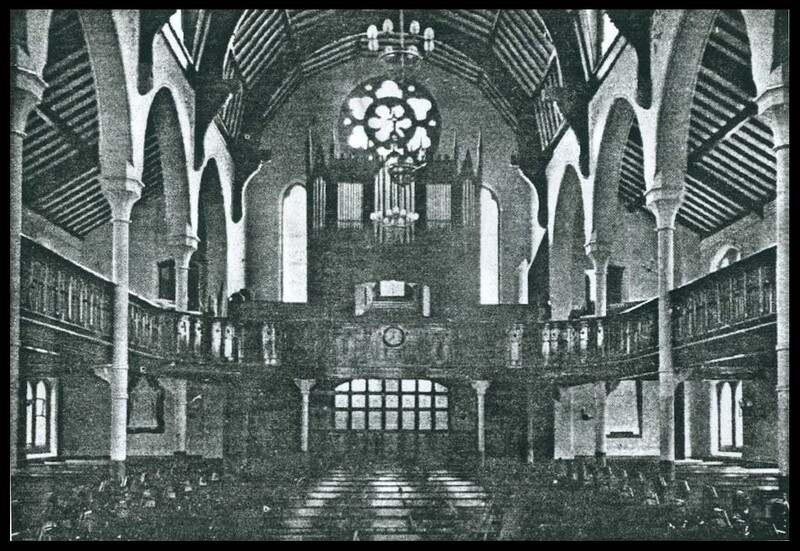 Showing the magnificent Organ, erected 1908, by Mr. J. J. Binns, of Bramley, near Leeds. The oak case from the organ erected 1855 has been used, and several of the old stops have been placed in the new organ. I think that the reasons for the difficulties with the trustees may be simple. Roger and Mary Crompton led the Fletchers into the New Church - the Fletchers even moved into the Crompton house at Kearsley as soon as it became vacant. But the Fletchers were increasingly "big business" with links overseas and into the USA, and in the sphere of a small town in those days probably became autocratic (without knowing it?) That can easily happen to any of us. As late as 1887 a Fletcher was a trustee of the General Conference and on its Council. He probably expected to be unquestioned by the local Church folk, especially as the firm then - and I believe into quite recent times - financially helped the Church. A bad relationship between the trustees and the ordinary worshipper would be set up and. become traditional. When that Fletcher died in 1887, the Conference, a bit blindly I suspect and making rash assumptions, appointed his brother to succeed him as a Trustee of the Conference. That brother was murdered in most unsavoury circumstances within six months - and got no obituary in the Conference! uncle and aunt, that is, of my grandfather, the Rev. W. A. Presland, henceforth WAP. WAP's grandfather John, the hatter of Piccadilly, had a daughter Mary Ann who as I say married Roger Crompton. I am guessing Mary Ann met Roger at Dr. Bateman's house, because Roger was a Lancastrian and there seems little reason why Mary should have met him in the North, but he was a great chum of Dr. Bateman and could well afford to travel (possibly even on business) to London. (I know of no photographs of Roger and Mary Crompton.) Roger was of a well-to-do New Church family and had inherited a large paper mill, by the river Irwell, at Stoneclough Brow, near Kearsley and Bolton. It became a flourishing business, with in the mid-19th Century to Dr. Bayley's astonishment machines "which could turn out 12 miles of paper per day." The Cromptons divided their time between their home, Kearsley Vale House - which after it ceased to be used by succeeding owners of the mill as a private residence became, at least until 1973, the club house for the firm's employees - and "a house in Regents Park, London, where they kept an almost princely retinue of servants." The address I have traced and it was "Sunnyside," Upper Avenue Road, Hampstead in 1859. Presumably what is now Avenue Road by the Park? Roger died in London in 1859 aged 62 and his wife in London in 1863. All their lives they played an active part in the affairs of the New Church, especially at Kearsley. He helped pay for the first building there in 1837 - and virtually paid by his large legacy there for the later Church, pulled down in the last few weeks as I write because a new one had just been opened; he worked in the Sunday School, on the committee and was a Trustee. (It seems a strangely ironic circumstance that the later trustees of that Kearsley Church became very difficult to handle - Charles Newall in his ministry there found them impossible - and I as Secretary of Conference got involved in 1957 in a struggle, which we won, to get rid of all personal trustees in Kearsley in favour of trusteeship by the General Conference as an incorporated body. Whether Roger was difficult I shall probably never know). Roger was too of course a powerful figure in those Victorian days in the district and in local affairs. In his will, he said his paper mill was to be valued by two valuers, one appointed by Roger Fletcher (who was to have the first refusal to buy) and the other by his executers and "as an acknowledgement of the long and faithful service of Robert Fletcher in the management of my said business the goodwill of the business is not to be considered." Fletcher bought - the business prospered, and there are some rather nasty signs that it prospered largely on sweated labour (perhaps it had done under Roger Crompton?) It is a strange fact that few of us are clear-sighted enough to think in advance of our times, and quite a few well known New Church people seem to have been unable to see how their workpeople should be treated. The growth of the trade unions was a good thing in those days. Note. Roger Crompton's estate ran well into six figures - a great fortune for anyone in the 1859 period. It does look as though he did not use sweated labour anyway. Roger was buried in Highgate Cemetery but a memorial service was held in the Kearsley Church. At this service, with a parade of grief a bit typical of those times, "the whole congregation was in mourning, end his widow and daughter provided all the Church officials with black gloves, silk scarves, and hat bands. The men from his works came in procession to church, wearing the same emblems of mourning His generosity, always manifested in his life, lives after him, as he not only provided for the church he loved so faithfully, but left large sums of money to various other objects of use in the New Church. The total amount of his benefactions was about £17,000. For many years it had been Mr. and Mrs. Crompton’s custom to receive the members of the Church and Sunday school at Kearsley Vale house on the annual procession day, a treat which was looked forward to from one Whit-Friday to another. It seemed as if the sun always shone and the flowers always bloomed there, and the hospitable reception accorded by the host and hostess left nothing to be desired. After walking through the grounds, the company was formed in a semi-circle on the lawn, and hymns were sung. Then coffee and buns were amply served, dancing and games were indulged in on the lawn, and the children dispersed to enjoy themselves. Evening came on all too soon, when after another hymn every person received an orange on departing. This hospitality was continued for many years (after Mr. Crompton's death) by the late Mr. and Mrs. James Fletcher, and more recently by Mr. and Mrs. Fletcher, the present residents at Kearsley Vale House. Dr. Bayley in his "New Church Worthies" refers to "Mr. Crompton with his good father and brother attending worship at Ringley in the early part of the 19th Century." 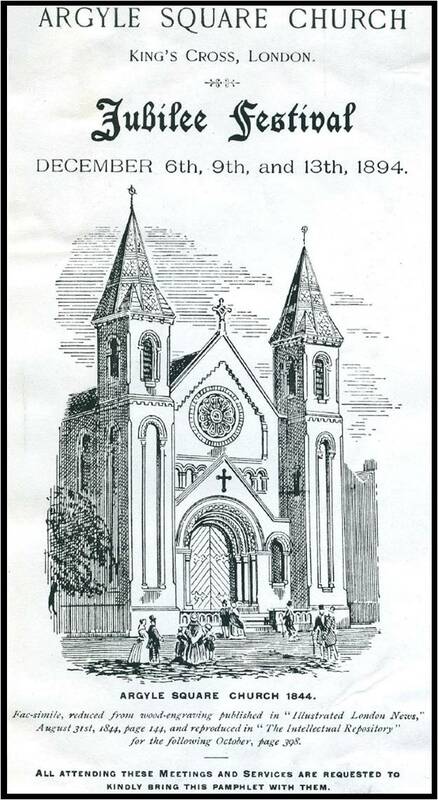 On Sunday, September 11th, a special general church meeting was held for the purpose of expressing the sentiments of the society in reference to the late Mr. Roger Crompton, when the following resolution was carried: - "At a special general meeting of the Kearsley society and congregation, held on Sunday, September nth, 1859, to express their sentiments in reference to Mr. Crompton, who had been a member of that society from its commencement, and who was removed into the spiritual world on the 2nd day of August, 1859; It was resolved, that the members of the Kearsley society and congregation hereby record their affectionate esteem for their departed brother, who set an example of attachment and liberality to the Church, so worthy of the imitation of each according to his means; and they further desire to record their gratitude to the Lord for having put into the heart of their brother to provide so liberally for the support and extension of the Church at large, as well as for the welfare of the Kearsley Society in particular; and whilst they sympathize with his wife and daughter in their bereavement, they feel that it would be wrong to grieve at a dispensation which, though an apparent loss to those who are left behind, they humbly believe to be an unspeakable gain to himself. At a special general meeting held June 28th, 1864, it was resolved, "That the schoolroom be enlarged in order that the duties therein performed may be more fully and efficiently carried out." This was done and the school re-opened in October, 1864. It is recorded in the Intellectual Repository for November, 1864, "This Sunday school has recently been enlarged and some important additions made to it. The schoolroom now measures 45 feet by 36 feet and is 18 feet 7 inches high. It is lighted by fourteen windows 9 feet 6 inches by 3 feet, filled with frosted glass with margins of stained glass. Though not so large as some, for simple elegance of design and character it is not exceeded, if equalled, by any other schoolroom in the church. At the west end a commodious wing has been added, containing an ante-room, with convenience for tea meetings, etc., and above is a classroom 15 feet by 19.5 feet. Accommodation is thus provided for nearly 400 children. We hear that some thoughts are entertained of establishing a day school." (That school was built - Mrs. C. H. Presland attended it! - it is listed in 1897 Conference documents as having 459 scholars, for it was no small school, of whom 54 attended Sunday School. 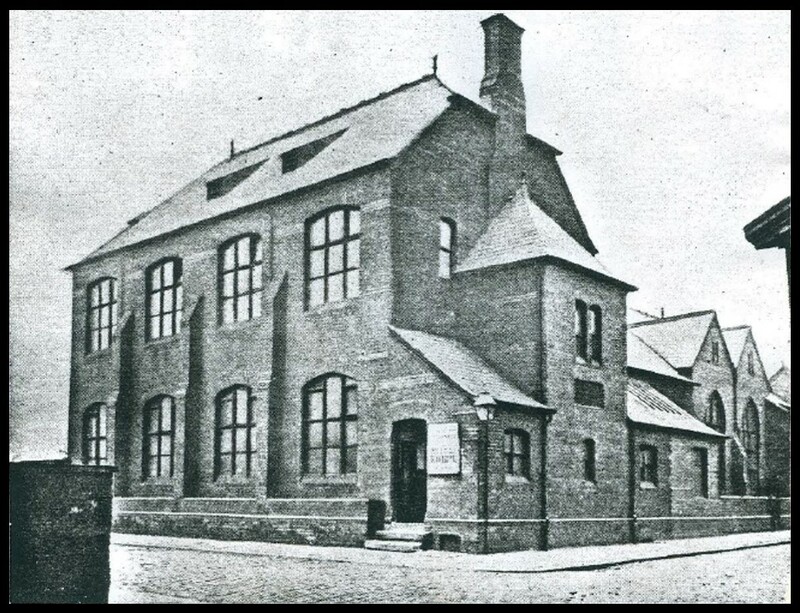 "In 1922 the large and massive school building was sold to the Lancashire County Council Education Authority. Certain rooms of the building were still used however up to 1956 for Sunday Schools and other purposes." I have myself attended many meetings there. See R R Gladish "History of New Church education" 3 volumes, in my study. See page 27A. 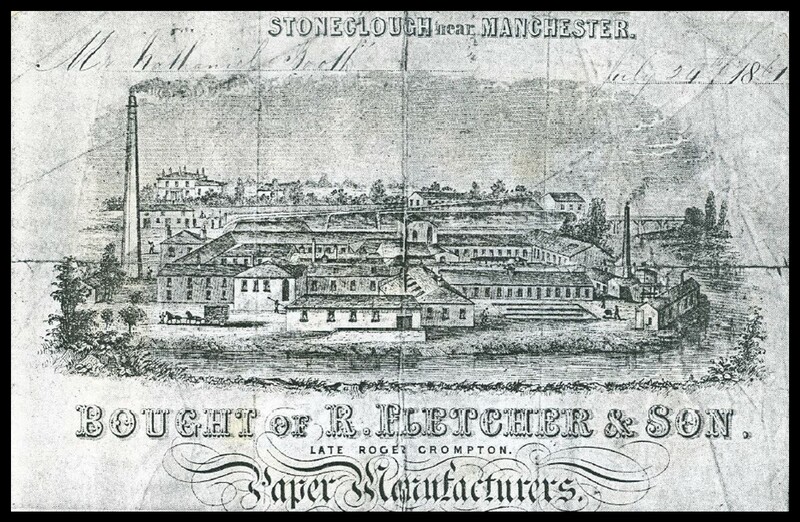 Much that I know about the Cromptons comes from my copy of the "150th Anniversary History of Robert Fletcher & Son, Ltd." 69 pp., printed in 1973 - direct descendants of the Stoneclough Mill, now a major paper manufacturing firm, with a prestigious London office at Grosvenor Gardens. (I begged a copy from them!) They are a subsidiary of the vast Imperial Tobacco Co., which in 1915, finding its supply of cigarette paper from France was in danger, took a major financial interest and i. d. c. (in due course) did a takeover. Interesting to note that in 1965 millions were spent in tearing down Roger's paper works as part of a giant project and the then-minister of Labour, Ray Gunter, M. P., did the official opening. Window to Woodford Green and the new college there. It has never been seen since! My guess is that it was left in one of the many outbuildings at Woodford Green. Why do we do that sort of thing? (We are at present doing it with the Isaac Pitman Memorial Window, which we took out of the Church in Henry Street, Bath, and I'm told no one is worrying about doing anything about it. Oh, dear!) Let us talk now about great grandfather Thomas. NB One of the Seddon family, which always was known as the "dictum-factum" locally, went to the USA and became a NC Minister there. Died 1865- We have no relationship with the great Latinist! A view of Kearsley Paper Works from the river on an old invoice heading dated 1861. My great-grandparents, Thomas and Jane Presland. WAP tells us - see article early in my chapter one - that only Mary and Thomas of the eight children of John Presland the hatter and his wife Mary Ann stayed in the Church. But in chapter one I list nine children, which puzzles me, as we know of the baptism of all save the oldest (and that may turn up yet.) Briefly - John the eldest may have been the one who much worried his parents as he gets left out of the will save for the £1000 and the house. Samuel seems to have had a dilettante interest in the Swedenborg Society but makes no mark on it. William dies young (Philip Henry - I Know nothing about, save we have a Philip Henry Johnson (father of Ian and Pat) coming in due course, Mary Ann is Mrs. Crompton. Sarah, Ann and Sophia I know nothing of, although I have a feeling I have heard one died young. 1 [Unknown daughter] Unknown (Still born?) See twice (here and here) WAP. 2 John* 18 Nov 1839 Became a minister. 3 Mary Jane* 4 Aug 1841 Married James Graham. 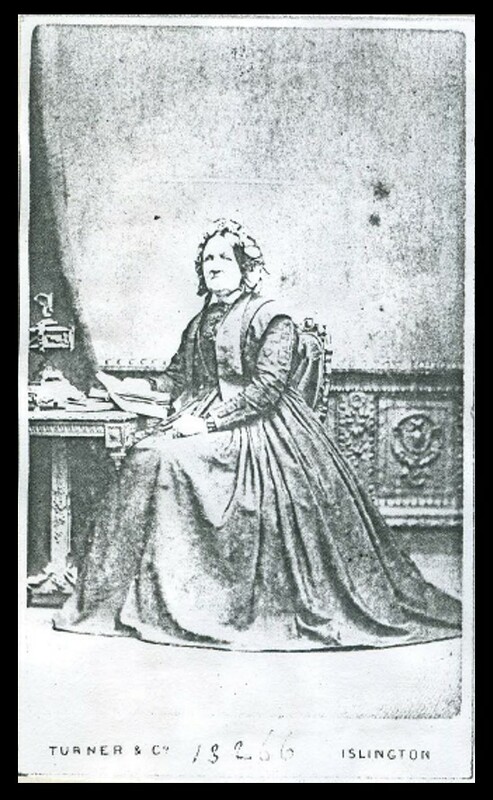 5 Ruth* 11 Jul 1845 Married Rev. Edward Miall Pulsford. 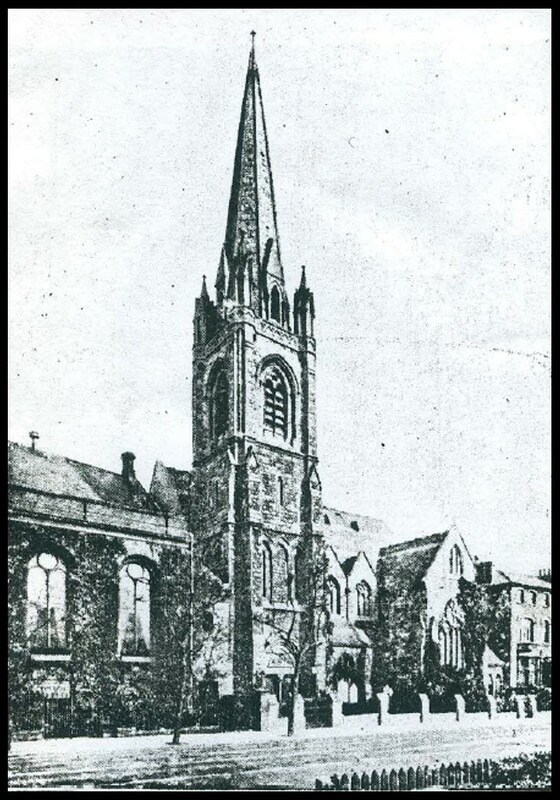 6 Thomas** 11 Jan 1847 Drowned, buried in Brightlingsea old Church (with its great tower). 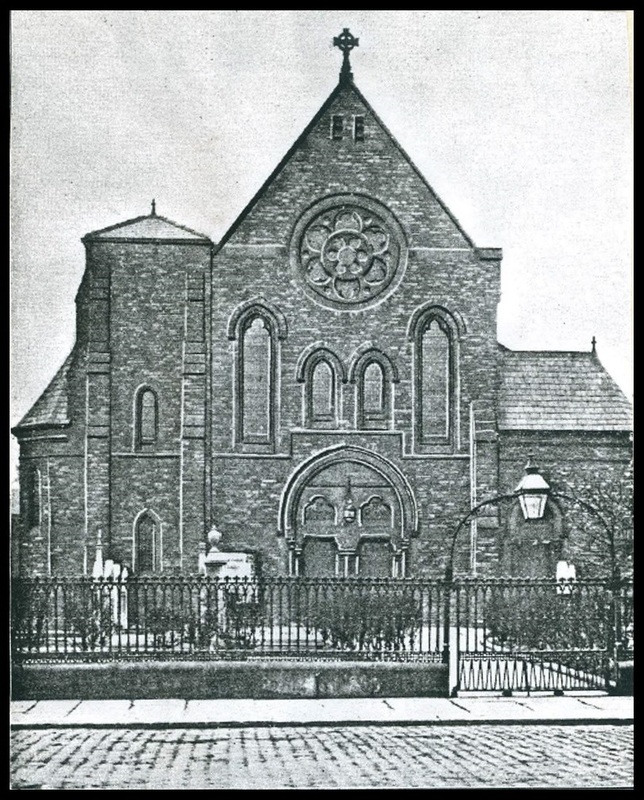 10 William Alfred* 12 Aug 1855 Becomes a New Church minister, married Unity Josephine Purcell. This is WAP. 11 Sarah Emily 31 Dec 1857 Dies age 3. * all so marked, in each case with their married partner, were active in the Church all their lives. (Thomas seems in this respect to have done better than his father! **This accounts for an insistence with WAP, and his sons, that none of us should play in the sea alone, or go on boats, until we could swim at least adequately. That insistence by WAP saved the life of one of his own sons. Matilda born in 1843, may have died young - else it would be strange to call another daughter by that name. Anne I have no knowledge about. I am intrigued by Thomas Presland - how I wish I had asked WAP more about him. Perhaps one of my generation knows more. He, with his beloved Jane, was so obviously keen on his Church and a man of faith. But, unlike his father and most of his relatives, he seems never to have taken a prominent lead in Church affairs. He was never a "Conference man" or a Swedenborg Society councillor. Yet is it not noteworthy that he and Jane had a family which makes so many links for us - the Presland family with its links is slightly less complicated than the London Underground map. Was there perhaps some limitation which made him unhappy in public - something physically difficult to cope with? His picture reminds me very much of WAP, but unlike WAP he has left nothing in writing. Why should he? Perhaps he preferred the simple homely things? By the way, how did I get these photos? 1975 a Muriel Spurgeon wrote to me as "Dear Cousin," from Clevedon, and said she was sister of Foster Humphreys and cousin of Laurence Pulsford and "other members of the Presland family", and would I like to have her collection of pictures. I did not say NO! She was, she said, a granddaughter of Thomas Presland. Read the obituary. Obituary notices in those days, and until relatively recently, were lengthy and full. Note how Thomas was a widower for many years. Perhaps he just wanted not to be prominent. (I smell the pen of his son, the Rev. John Presland, in this obituary.) As I read the obituary again, for the first time in many years, I feel Thomas was a man who knew disappointment and sadness and yet never failed to hold on to the vital things of his faith. I think we might have liked to know him - and his quietly reserved nature might have taught some of us a lesson! On Thursday, March 14th 1895, at his residence, 39, Romilly Road, Finsbury Park, London, Mr. Thomas Presland, in his eighty-second year. In Mr. Presland the New-Church on earth loses one of its oldest members. His father, Mr. John Presland, was one of the original trustees of the Conference; a founder of the Swedenborg Society and of the Missionary and Tract Society; an active worker, indeed, in all the New-Church uses of his time, as is abundantly testified in the obituary notice published in The Intellectual Repository for 1826 written most probably by his friend, the Rev. Samuel Noble. Thomas, the youngest son of this exemplary New Churchman, was born on the 4th of January, 1814, and baptized at the church in Lisle Street, Leicester Square, by the Rev. Joseph Proud, who was at that time its minister. He was originally intended for the law, but the death of his father at the early age of fifty-three years, leaving a widow and seven children, necessitated a less ambitious career. He was accordingly apprenticed in April, 1828, to the late Mr. James Shirley Hodson, then and for many years afterwards, the printer of the greater part of the New-Church literature published in this country; and on the expiration of his indentures he entered the important office of Messrs. Spottiswoode and Co., in which the Rev. T. C. Shaw was afterwards a partner, where he remained, valued and respected by his employers and colleagues, for more than fifty years, until his retirement about eight years ago. On the 5th September, 1835, Mr. Presland married Miss Jane Johnson, a life member, like himself, of the New Church, who preceded him into the eternal world on the 16th February, 1876, and in whose memory he inserted in The Intellectual Repository for that year, p. 192, a brief but affecting notice, Of their family of eleven children seven survive both parents; two sons, the Revs. 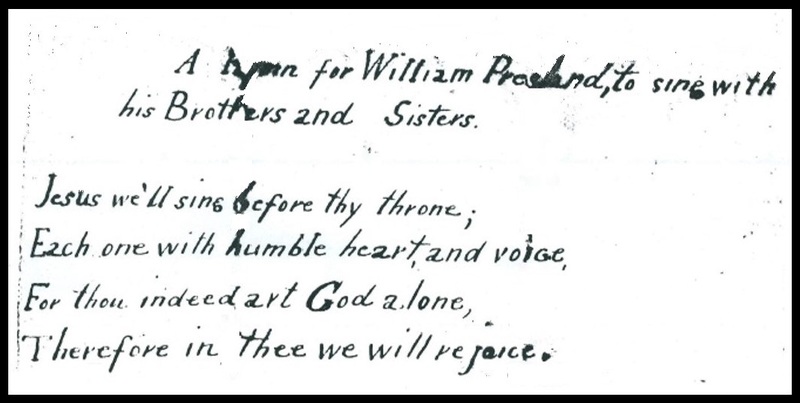 John and William Alfred Presland, and five daughters, the second of whom is wife of the Rev. Edward Miall Pulsford. Notwithstanding many difficulties in rearing and educating so large a household, their home was an almost ideal scene of domestic happiness, because centred in and founded upon conjugial and parental love. To love and honour their mother was the first and constant lesson impressed upon the children by their father’s example, even more strongly than by his precepts; while affectionate helpfulness towards each other, the avoidance of everything untrue, unkind, or coarse, and the cultivation of a disposition to be of use, were the principles inculcated for the general guidance of their conduct. When the kindness of his elder sister, the late Mrs. Crompton, of Kearsley, sent his eldest son to school at Belper under the charge of the recently departed Mr. Robert Appelbee, the father's weekly letter became a treasury of strong and tender counsel, making continuous the sense of his firm yet gentle guidance, and bringing the sphere of home into the school-room and playing field. Each letter, moreover, contained a liberal instalment of some original tale, the extempore narration of which by the father to his children, during a country walk or at the fireside, had been extended - with how much labour and patience who can say ? - to the member of the family in temporary exile. Indeed, the cultivation of simple pleasures- the blameless delights of a rural ramble, the wayside flower, the gambols of a kitten, the strenuous yet friendly conflict of chess, the sweet companionship of healthful books - was always conspicuous in his method: if "method" is the right word for an influence communicated far more by the unconsciously appropriated magnetism of example than by any formal or didactic lessons. So, too, the love of the church and of the things of the church was instilled simply and naturally. As a matter of course, no question being asked or preference consulted, the children were taken to church by their father every Sunday morning. If distance prevented the little feet from making the journey twice, the evening was devoted to reading from the Word the story of Joseph or Daniel, of David and Goliath, of the raising of the widow's son, the sisters' brother, or of the ruler's little daughter; while New-Church hymns, sung to well-known and dearly loved tunes, brightly varied the simple but useful little services. Those who only knew Mr. Presland during the last twenty years or so can have little idea of the vivid buoyancy of his earlier manhood. The failure of a near relation having involved the total loss of his patrimony, his active mind, while undeviating in devotion to his regular employment, sought in invention and in literary endeavour the means of improving the prospects of the dear ones dependent on him. Want of capital and of leisure to perfect these extraneous labours led to the disappointment of many a hope, and the patient fortitude with which he sustained these trials won the admiration of those who knew of them. Trust in Providence was at all times the anchor of his heart, holding him secure where a less constant faith might have faltered and succumbed. His old age was the fitting conclusion to the modest simplicity of his life. Never prominent in public affairs - in which respect he was a marked contrast to his father - he established himself, on retiring from business, in the household of his youngest daughter and her husband. Unless prevented by increasing infirmities he attended the morning service at Argyle Square, where he was the oldest member; and when unable to be present he regularly sent his contribution to the weekly offertory. His great delight was in association with his grandchildren; indeed all the little ones of the neighbournood knew and loved him; and since his departure one of his fellow-members at Argyle Square remarked that it is easy to picture the little children in heaven running to greet him with flowers and kisses. Thus he continued, peaceful and contented, until on the 5th of March, he was seized by the prevailing epidemic of influenza which the following day to seek the bed from which in this world he never arose. His sons and daughters rejoice in the conviction that, "in the land of the living," he has rejoined the wife and mother he and they loved so dearly and remembered so tenderly, and that there those whom God hath joined together shall be "no more twain." You will find a split infinitive in the Argyle Square printed pamphlet. I comment on it because John Presland was quite incapable of doing such a thing - probably got all worked up about it! By the then standards he was a brilliant writer - today probably he would be called a bit pedantic! What if the old is better? 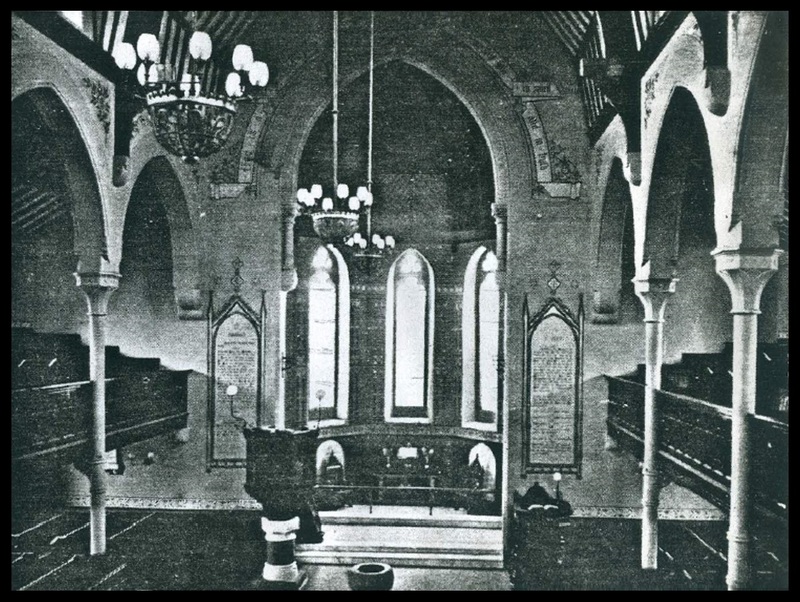 The Camden Road Society of the New Jerusalem Church. The first public worship of the New Church took place on the 27th of January 1788 at a rented chapel in Great Eastcheap, London. In due course there developed from this two groups which, after in each case various changes of meeting place, became the Argyle Square and the Camden Road Societies of the New Church. These two united after the second world war to become the North Finchley Society. I'm told the speeches all were good. I can but tell you what I heard. I can tell you no more about the great-grandparents Presland, but I now tell you about their oldest son, the Rev. John Presland, brother of my Grandad WAP. great-uncle John, the 4th generation in the Church [married Martha Pulsford]. In my files there is the E. J. Broadfield appreciation of him - a most interesting article, and written by a man of some standing. But I prefer to give you WAP's with the personal touch and I doubt if you need both. But John clearly had a very wide interest and marked ability and he was sure some worker! I came across an Argyle Square Manual for May 1897 at one time, and I commented on it in the Anerley Society's Newsletter. 10:00 a.m. Minister's class and Sunday School. 3:00 p.m. Minister's class and Sunday School. 4:30 p.m. Teachers' Tea Party. 8:30 p.m. Holy Supper - and the Preslands lived in Freegrove Road (as we did in our childhood) and must have walked or gone by horse-bus. Several of John and William's published books are in my study. All are good, but dated. All out of print. John on "The Creed of the New Church" is verbose but clear indeed. WAP's "Correspondences: the key to Causation and Revelation" was regarded by E A Sutton, M.A., B.D., Principal of the College in my day as "a magnificent classic." The two ladies? The photographs are marked "unknown". Mrs Roger Crompton? - an obviously expensive Baker Street photographer? Your guess is as good as mine! By the REV. WILLIAM A. PRESLAND. My brother was called to the spiritual world on May 1st, 1897. The serials of that time should be consulted for statements of his many uses to our Church. Two intimate friends of long standing set these forth - Mr. E. J. Broadfield, in The New-Church Magazine, Mr. James Speirs, in Morning Light. They bore testimony that he had served the Church and its allied Institutions in the highest offices. The minister of Argyle Square for twenty-five years, he had also for over ten edited this Magazine; since 1881 he had been Professor of Theology at the College, four times had he served the General Conference as its President; he had acted as secretary of its Hymn Book and Liturgy Committees. A frequent contributor to our periodicals, he had also produced more permanent work. His Creed of the New-Church furnished a concise and convincing exposition of leading doctrines; on these also New Truths for a New Age is a highly valuable "Silent Missionary." The spirituality and felicitous diction of his sermons on The Lord’s Prayer make strong appeal to the devout heart and mind. But his public life and work are not my theme; rather his personality as disclosed in the family, and to his most intimate friends. 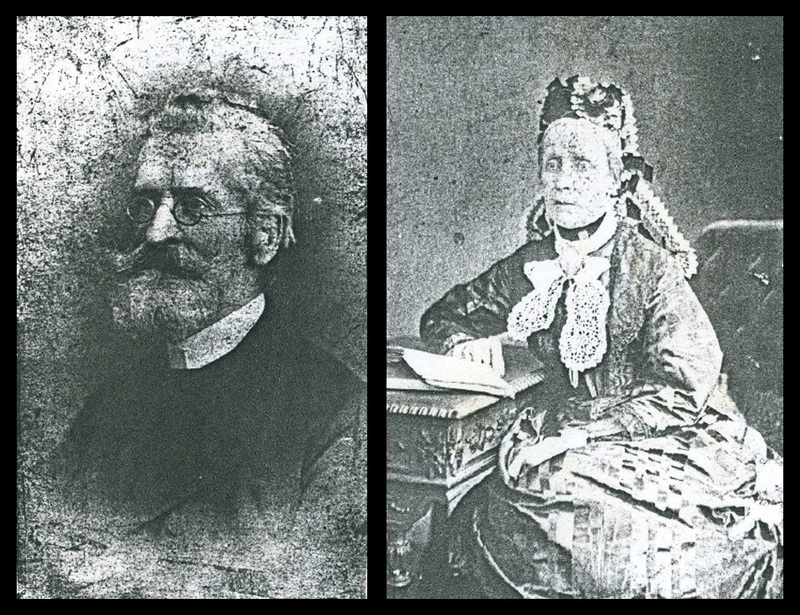 When to our parents, Thomas and Jane Presland, was born in 1839 their second child and first son, it was decided that he must bear the name of his grandfather, one of the founders of the Swedenborg Society, who himself owed his introduction to the New-Church to his father - an earlier John Presland. And when the present writer proposed to name his first-born "Thomas" in honour of the best of fathers - "Call him John," said he, "and he will bear the name of a good man." The eldest but one of eleven, my brother was sixteen years senior to myself, the penultimate of that long series. He had his early schooling at Dame Owen’s Foundation in Clerkenwell, but passed, aged ten, to Belper Grammar School, where, like myself many years later, and an intermediate brother, he was privileged to be a pupil of that fine New-Churchman and born schoolmaster, Mr. Robert Appelbee. Eleven years were spent there - first as one of "the boys," later as an assistant master, in which capacity he was associated with another notable New-Church preceptor - the late Mr. Thomas Lowe, of Birmingham. He early showed the mind of the willing learner. It is recorded that, asked to commit the Beatitudes to memory, when the time came for repeating them, he gave the whole Sermon on the Mount. He read rapidly and retained tenaciously -hence his wide range of general knowledge. Dr. Bateman said he "could talk intelligently on any subject." Literary tastes were also early developed; he had read Shakespeare from beginning to end when he was twelve. Among literary remains of those early years is a Serio-Comic Opera, and a lecture on Light. Home-coming for the holidays was eagerly awaited by brother and sisters, for he brought them six weeks of thrilling interest, and high-spirited devotion to their entertainment. Our eldest sister, Mrs. Graham, says of him at this time: "He was a genius, and in many ways original.'' The end of these half-yearly periods was approached with real sorrow by the little company of admirers. I recall one of my earliest problems, the attempt to grasp the meaning of "brother." Here was a man, taller than father - what was this mysterious bond between him and my puny self? I cannot recall how or when I solved it. Later, at five, I had another, connected with my first but really poignant sorrow. Little Emily was seriously ill: little Emily - my dear little play-fellow - lay so still, and made no response! Brother John, with tearful eyes for the loss of little "Popsy" (his pet name for her) takes me on his knee, and tells me that Emily has gone to Heaven; he is trying to help me see what this means. Was I a gross little materialist, or unusually dense? I could only think of her as the lifeless little form! By twenty-one, finding the appeal of Literature irresistible, he became associated with Mr. George Henry Townsend in compiling his Manual of Dates, and as sub editor of The Press - a weekly paper long since discontinued. Always, like Charles Lamb, Samuel Johnson, and Charles Dickens, a great lover of London (he had lectured at Belper on "How to see London for Nothing".) he now entered very fully into the life of the metropolis. One of his chief pleasures had always been, and ever remained, to roam about its busy streets, taking stock of the people, the exhibits in its richly stored shops, and its noble public buildings. He threw himself also into the life of the Church, pre-eminently his Church - Argyle Square - of which he had watched the building as a little child. He became one of the active band who made the Junior Members’ Society - not limited to those whom we now so designate - as famous a centre of culture as of amusement. Their Sunday afternoon Conversational Meeting, Monday Theological Meeting, Tuesday Elocution Class, and weekly General Meeting had his earnest support. They aspired to high Drama, took the adjacent Cabinet Theatre for occasional Shakespeare productions. An uncle once saw there The Merchant of Venice. "Who is that tall, handsome man playing' the Duke'?" he asked. And the reply came: "Why - don’t you know your own nephew?" When in after years he had distinguished himself in the ministry, someone, recalling those days, declared that whatever his success there, the stage had been deprived of a great actor! This was but an indication of a remarkable versatility. Had he devoted himself to painting or to the violin, he would probably have made his mark. Occasional help as a preacher led his minister - Rev. Jonathan Bayley - to suggest that there lay his vocation. On full reflection, he thought so, too. And in Jan. 1867, he entered his first pastorate, at Derby, in succession to a kindred spirit, the Rev. John Hyde, on his departure for Peter Street, Manchester. As a Belper School-boy I saw much of his happy home life with the partner he had chosen at "the Square," and had married some two years before - Miss Martha Jane Pulsford, sister of the late Rev. 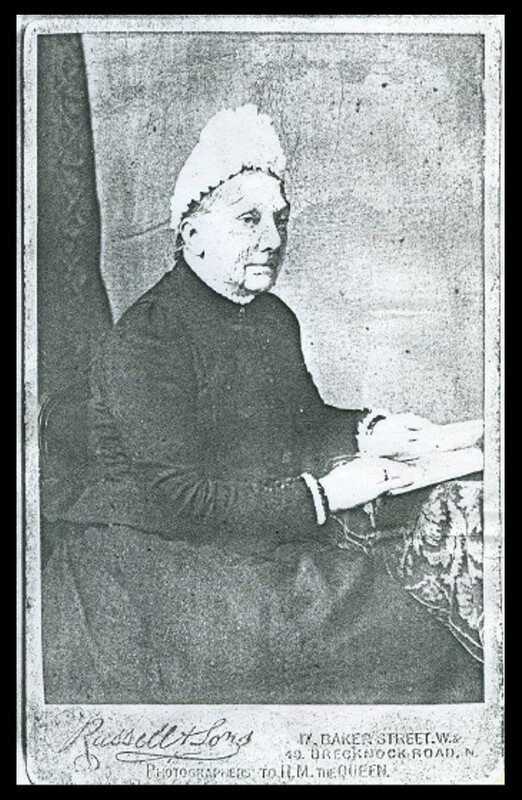 Edward Miall Pulsford, and aunt of our honoured Missionary in South Africa. Theirs was an ideal union, love growing deeper and stronger with the years. The time came when visits from him were desired by the brethren in America. To these invitations, though doubtless very alluring in many respects, there was each time a courteous refusal. "I absolutely decline," he told me, "to put the Atlantic between myself and my wife." And the voyage was unthinkable, for she was never very strong, and one of the worst "sailors." I recall especially, the delightful little time when, after tea, one or other would read a short instalment of Dickens or Thackeray; and an invariable diversion following Sunday’s dinner - selections from the great masters on the violin. Alas! The pressure on time when he succeeded Dr. Bayley at his old spiritual home in 1872, compelled him to lay this aside for ever. Of his merits as a preacher I need not write - except to remark that his knowledge of the letter of the Word was one of his most valuable assets. An intelligent west-countryman remarked that he knew no other minister so apt in his quotations in confirmation of its doctrines, or in illustration of its spiritual sense. It was soon after his settlement at Argyle Square that this preaching awakened a response in me. And I know that my brother in natural kinship, stood above all men as my spiritual father. With an upbringing for which one could not be too grateful, the precious truths of the New-Church had, nevertheless, to become my own by conviction. Associated in business life chiefly with those who scoffed at religion, I had to test the very foundations of my faith. Very graciously did the hand of the Lord uphold me in those perilous times. By His Word and the Heavenly Doctrines He brought me deliverance; and to that result the rational, convincing presentations of their teachings, with the telling appeals for fidelity to them and their Divine Author, Sunday by Sunday, were most vital contributions. With intense earnestness and devoutness there was coupled a keen appreciation of humour and a brilliancy of wit. As an instance: Mr. Harry Rowe, the newly appointed and resourceful secretary of the Mutual Improvement Society, to enliven its Annual Meeting, had suggested a lecture. We were being well entertained by one on Poetry and Parody. Mr. H. T. W. Elliott - afterwards Sir Thomas - ascended the platform to present the report of the scrutineers, just as, having finished one parody, the lecturer spoke strongly, "Here's another - Longfellow." Those who remember Mr. Elliott’s stature will see the fun in the prompt addition "Oh, I beg your pardon." Another, which also illustrates his facility for "falling into rhyme," will explain its origin and purpose. It is a letter written to the then minister of Accrington. How should the busy, portly P., from far-famed London town, reach beauteous Burnley’s blest abodes? by what road travel down? Can he the journey make direct, by taking of good heed? or would such effort, if ’twere made, prove but "more haste, worse speed?" Must he to Manchester proceed, and, through the city’s riot, reach Queen Victoria's terminus - so simple, and so quiet? There must he seek the platform which the legend holds to view, of "Burnley, Colne, and Skipton train," and book his passage through? And must he bring his surplice white, starched all so clean and fair, to consecrate, with brother Will, the church erected there? With love to Josie, John, and Claud, from Ethel and Mamma, also from me, and unto thee, priest, husband, and papa. He fulfilled the engagement that bitter winter, under conditions almost dangerous, having but just left his room after an attack of throat and bronchial trouble, to which he was liable, "packed in cotton wool," as he explained. He ran more risks than people knew, at duty’s call. "The portly P." combined with that distinction..... more vital elements of an arresting - one might say, a commanding - personality. To cite a case in point: an obscurity in the marriage law led him to headquarters at Somerset House. The official gave an explanation which was not satisfactory. "Will you permit me to see the Act? Pardon me! I think you must have overlooked this point." And so it proved. But for the relaxed throat referred to, his health was generally excellent - never a sign of brain-fag or headache with all his mental labours. Yet, unsuspected, he had been doing too much, overlooking the common need for one day’s rest in seven. Always taking a good holiday in August, he returned to work until the next came round with rarely a day’s real respite. Rest for the brain worker should mean a thorough break from "the daily task," physical in exchange for mental activity. I have told of his knowledge of Shakespeare. He had a series of readings given at Mutual Improvement and kindred Societies, also at the Royal Normal College for the Blind. Norwood where he was Honorary processor of literature. This he had entitled "Shakespeare's History of England." These plays and many others he "cut down" so skilfully that one would need to know them well to detect omissions. "When I want a rest," said he, "I just take one of these little books and see what I can omit, without utterly spoiling it." To do this, preserving rhythm and rhyme, not seriously affecting the plot, and to do it so neatly that anyone could easily follow it, was not what most brain workers would regard as relaxation. A sedentary life, combined with prolonged and intense mental application, has, it is to be feared, prematurely deprived the Church of other men most useful - for instance; John Hyde, Rudolph Tafel, James Hyde. I had come from Manchester for a meeting of the old Missionary Council in the autumn of 1896. My brother as chairman presided with his usual ability. When we parted, I thought, "There goes a typically strong man." Next time I saw him, six months later, 'twas on his death bed. His Christmas letter spoke of severe nervous exhaustion threatening vital organs, and of the generous provision of his dear friends at "the Square," for a three months’ rest. Those organs were soon implicated. With Easter came most serious news. I shall never forget the great kindness of my own dear people at South Manchester, in leaving me free to spend the last fortnight with him. The prospect was all the more sorrowful since I had then responded to the Camden Road invitation - with no little delight looking forward to our being so near each other - ministers of the twin-sisters, descendants from Great Eastcheap. His sufferings were great, but great also were his patience and hope. We had many bedside services, and he would speak of the Lord’s gracious provision for all states, all experiences. A week before the end, in pain and weariness he uttered a prayer, which I strove to recall soon after; but I fear my memory failed in justice to a beauty of expression that had become spontaneous. O Lord Jesus! I pray for patience. Give me patience. Lord. Patience to endure the sufferings permitted by a mysterious Providence. Patience that I thwart not the benign purposes of Thy love. Patience to co-operate with all that the angels are doing; that I may be resigned and submissive; that Thou Thyself mayest do all things. And grant me to arise beyond all suffering, where mysterious permissions are forever past, and the fruition of trial is seen in the gloriously beneficent appointments of Thine Infinite Goodness. Amen. As the honoured official, the faithful minister, the beloved brother breathed his last, I spake The Psalm of the Good Shepherd; and he seemed faintly to indicate response. "Surely goodness and mercy shall follow me all the days of my life, and I shall dwell in the house of the Lord forever!" So many worlds, so much to do. How know I what had need of thee. For thou wert strong as thou wert true. NB A battered Revised Version Bible in my study was presented to WAP by the Burnley people in January 1887 in "esteem and affection”. You may read of the funeral service in our serials of that time. But this you will not find there. For the disposal of the remains, the services of an old friend - a fellow member of that Junior Members’ Society - were sought. "Let there be no sadness of farewell," was my instruction. The reply was that the remains should go to their resting place on a car whereon never yet body had lain - a car all white, as befitted the purity of the life ended here. At the very end, this friend of long ago brought a beautiful wreath of lilies - meet, as he said, for one who had worn "the white flower of a blameless life." February 17th. at the home of Mrs. H. Keene Oliver, 3, Oxford Terrace, Lyncombe Hill, Bath MARTHA JANE, the widow of the late Rev. John PRESLAND, of London, in her 65th year. On Sunday, February 17th 1907, MARTHA JANE PRESLAND passed on to the eternal world, full of confidence in its reality, and supported by the hope of there rejoining her husband, the Rev. John Presland, who preceded her May 1st, 1897. She was the elder daughter of Edward and Martha Pulsford, who attended Argyle Square at an early period of its existence. Her connection with the Society was therefore almost lifelong, and her association with its activities began as a junior member and teacher in the Sunday school. Of a bright vivacious disposition, her personality was soon recognized, and her dramatic instincts and talents requisitioned for the entertainments got up by the young people, in which she invariably had the part of the leading lady. The love of poetry and the drama was a vital influence in the temperament of her future husband, and, no doubt, had much to do in bringing about their closer relationship. They were married by Rev. J. Bayley, at Argyle Square, in 1865. Two years later they removed to Derby, where Mr. Presland practically began his life work of the ministry and its highest uses. In 1872, they returned to Argyle Square, the home of their deepest affections, from then to be the scene of the exercise of their maturer powers. Mrs. Presland held the office of deaconess, was one of the ladies of the Benevolent Society, and was on the Orphanage Board. Three sons were born to them, all of whom died in infancy; her health was considerably impaired, and a certain amount of heart trouble frequently prevented the regular exercise of her duties, but her sympathies were always active in the cause of the Church. During her husband’s illness, her placidity and cheerfulness were a marvel to all her friends. His testimony of her at the time is recorded: "My precious wife, whose unremitting exertions, and patience, and devotion, and courage, and cheerfulness, night and day have been my unfailing support through all this weary trial." After his death, the distance and her failing health kept her from attending the services at the Square, but her interest was there to the end. On the marriage of her daughter Ethel to Mr. Hugh Keene Oliver, she went with the young couple to Bath, and there sustained by their care and affection she peacefully fell asleep. Of her, her husband’s words should be the best testimony: "She is full of good works." In my parents’ home, there was a set of pocket volumes of Shakespeare, beautifully marked for abbreviation purposes. I now know they were John Presland's, & I wonder if they are preserved by one of us. The Royal Normal College for the Blind, Norwood, was of course the builder of Windermere House, Crystal Palace – the scene in recent years of so many young people's meetings. John was on the Council of that College. I have a note that Argyle Square Society paid John Presland a stipend of £350 in 1888-1889. A lot of money in deed! 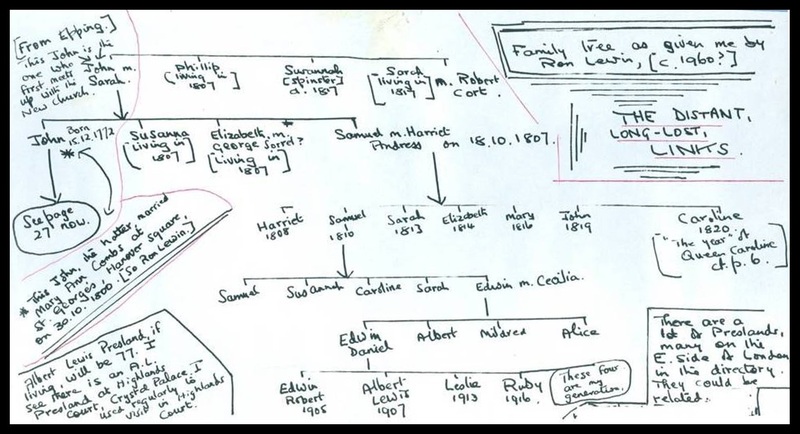 WHAT FOLLOWS IS A SKETCHY AND VERY ROUGH FAMILY TREE SHOWING UNKNOWN AND DISTANT LINKS, I HAVE ONLY DEALT WITH THE LITTLE BIT ON THE LEFT HAND TOP CORNER.